The Friday assembly this week was prepared and presented by pupils from Year 5 to showcase their recent trip to The Sustainability Centre in Clanfield between 8th and 12th October. This amazing place, just 10 miles from school, offers a completely different outlook on the countryside that lies just to the north of Havant and Waterlooville. For some children, this was their first time spending 2 nights away from home, and the setting is ideal as the accommodation is cosy and homely, and the site is calm and well maintained. Although so close to home and school, the pupils felt as if they were a world away from their everyday life during the visit. During the assembly, pupils recounted tales of their favourite activities from den building, clay oven making, night walking and farm visiting to name a few. There were plenty of photos to show and anecdotes to share, as well as tales from the campfire and games galore. As ever, it is a big undertaking for staff to arrange a residential visit, especially when it involves the school using a location for the first ever time. I am delighted to add that every single child from the year group was able to take part in the trip, building strong bonds between classmates that will aid their learning back in the classroom. So on behalf of the children and their families, thanks go to Mrs Edge, Mrs Crozier, Mrs Pearson, Mrs Taylor, Mrs Pelling and Mrs Richardson for facilitating such a great experience for the pupils. The sun came back for the fourth day of the year 6 Fairthorne residential and the children made the most of the sunshine by enjoying the water on stand up paddle boards. These are the latest fad in water sports, and plenty of children broke new ground, well new water really, in having a go. Children continued to develop their skills of persistence and teamwork while building crate towers, tackling Jacob’s Ladder and scaling the vertical assault courses. It has been great to see the pupil groups getting higher and moving faster on these challenges as the week progressed, reflecting the development and growing confidence of the children. Changing the pace a little, groups of children got creative during the Land Ecology session where they used leaves, twigs and mud to create natural art. Pupils also played detectives looking for animal tracks and making bug hotels. The outside fun will continue this evening with a camp fire, hopefully with songs aplenty and endless marshmallows. Friday morning has time for two activity rotations before packing up and heading home to St Peter’s to be ready for collection as normal at 3:15pm from the north playground. As this is the last blog from Fairthorne, I must thank Mr Pratley, Mr Land, Mrs Wibberly, Miss Stapley, Mrs King, Mrs Richardson, Mrs Chapman, Mrs Jonas, Miss Burch, Mrs Knight, Mrs Moore and Miss Honeywell for giving up their time, energy and enthusiasm to organise and run this residential trip. And finally, to you all, good luck with the laundry this weekend! It may have been rainy on Thursday, but it certainly didn’t dampen spirits as the Year 6 children took part in activities that required teamwork, perseverance and commitment. One of the activities was den building where children worked together to build a structure that would be waterproof, provide warmth and be large enough to fit the group of 5 children inside. What the pupils produced was very impressive. Children went on to develop their survival skills further by learning how to build and light fire; no easy task in the rain! Teamwork continued with an assault course requiring balance, strength and stamina whilst listening and talking to others to complete the course as a team. The final activity, ‘camo-tracking’, encouraged the children to get nice and muddy in order to hide in the forest, playing a number of games that required the children to move stealthily through the forest area without being seen. The children embraced all the challenges with admirable persistence. They are now getting dressed up ready for this evening’s entertainment…the disco! Day 2 at Fairthorne Manor saw the Year 6 pupils take on new challenges in outward bound adventures, in the morning even basking in beautiful autumn sunlight. The pupils are split into six groups, and each group will rotate around every activity over the course of the week. Today, the morning session was built largely around heights, as pupils took part in the Jacob’s Ladder climb, the aerial assault course, the zip-wire and the crate stacking challenge. All of these height based activities were led by trained Fairthorne staff who deliver not just safety briefings, but also humour, encouragement and praise to all of the children on each of their personal achievements. The afternoon session saw the pupils take to the water in two rotated activities. Pupils were guided on how to build their own log and barrel rafts, and they then put these to the test on the lake with some fun action songs performed afloat. The children also earned their water wings during a kayaking session, with Fairthorne staff and St Peter’s teachers being never far away in kayaks of their own. During this watery afternoon, every child took to the water aboard one craft or another, and each pupil achieved their own personal goal when meeting a new challenge. Well done to them all. This evening was spent in the sports hall, with colossal games of dodge ball designed to burn off the fish suppers everyone ate, and tire the children out once and for all for a good night’s sleep. Well, here’s hoping! 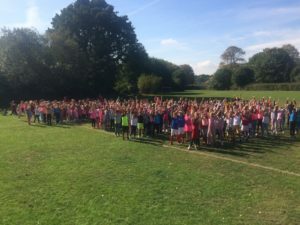 A blog for a Monday for a change, as Year 6 today ventured into new ground for St Peter’s in going to Fairthorne Manor near Botley for their residential. The year group were transported with bags small and large, and even very large!, to the wonderful grounds of Fairthorne Manor. Having settled into their four person shared rooms, the pupils were given a quick tour of the central site to find their bearings before a picnic lunch in the old orchard. The afternoon was spent on the main field, an enormous expanse of grass and woodland. Pupils took part in orienteering, sensory games and a blindfold woodland challenge, with much fun had by all. After a substantial dinner of chicken or veggie kebabs and cake, a fire drill was practised before heading out to the evening games. The pupils were set a series of challenges to work their way out of a jungle, using teamwork and torches to scour the area around the manor house at night time. When the time came for hot chocolate before bed, both were much needed. St Peter’s staff are spending their time supervising smaller groups of children in activities, during free time and at meal times, so future blogs will be posted well into the late evening during the week. Furthermore, Wi-Fi internet connection in the accommodation block is a challenge (I am writing this in my kitchen having returned home from Fairthorne after lights-out), so please be patient for updates. Climbing and water activities start on Tuesday. 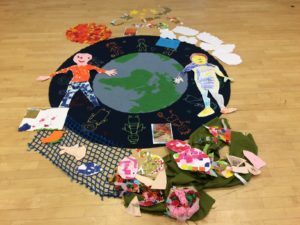 Pupils from Year 1 celebrated a wonderful Liturgy around the creation story this week. The worship had as its centre piece a beautiful arts and craft realisation of the seven days of God’s creation. you pour water from the mountains. who long to break free from poverty.